With only one night in Chicago, and a rainy one at that, I hopped into a taxi to the neighborhood of Logan Square to enjoy dinner and drinks at Chiya Chai, recently named Best Indian Restaurant in Chicago by Chicago Reader. 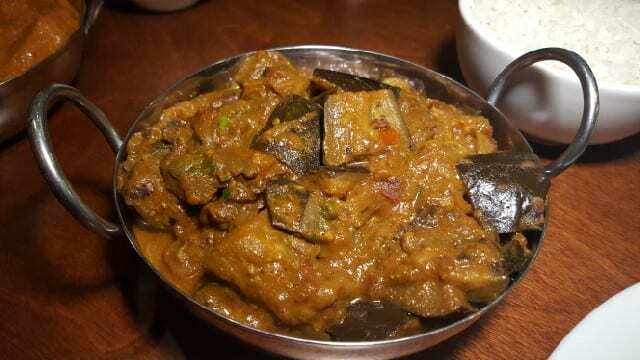 A fan of Indian food, I was looking forward to a comfort meal and got so much more. Chiya Chai is owned by brothers Swadesh and Saujanya Shrestha who grew up in the midst of the world of tea in Kathmandu, Nepal. Their family are Nepalese tea farmers and their father was one of the first exporters of Nepalese tea to the United States. Swadesh Shrestha recalled growing up in the foothills of the Nepalese Himalayas and loved going to his grandfather’s tea shop where he would sit quietly sipping a cup of milky chai as he watched the comings and goings of the village. 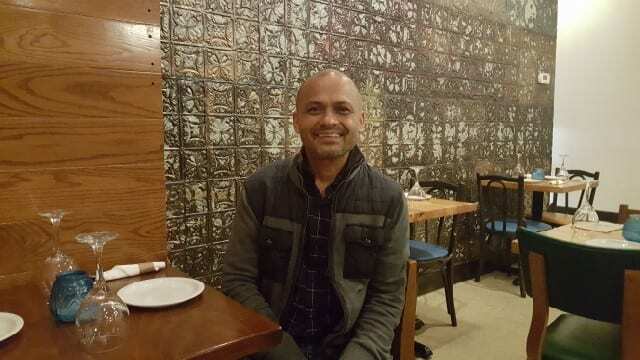 The brothers, along with Swadesh’s wife Rajee, who is also from Kathmandu, opened a restaurant in Minneapolis and ten years later, in August of 2016, opened Chiya Chai in the Logan Square neighborhood of Chicago. 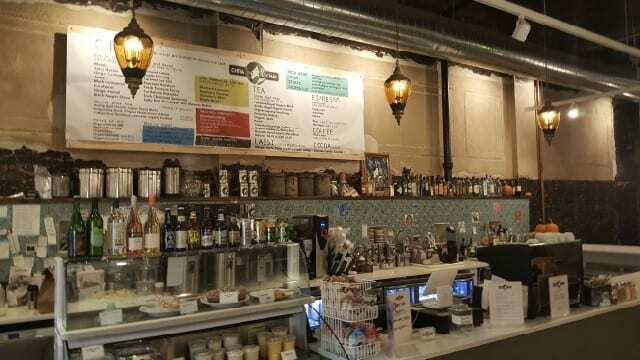 Chiya Chai is a casual location with a tea shop in the front offering 160 different chai combos. Using Nepalese tea sourced and exported by their father, and spice combination created by Rajee Aryal, Chiya Chai has one of the most expansive chai programs in the entire world. “Chai” is the word used for tea in many parts of the world. It is black tea brewed with selected spices and milk and it must have sweetness in order to allow the spices to shine. Each ingredient used, from fresh cardamom, cinnamon, ginger, peppercorns and more, adds subtle flavor changes. Rajee Aryal, who developed an affinity for spices at a young age, has created flavors ranging from classic, such as ginger-cardamom, to exotic, such as turmeric curry, horchata, salted caramel and maple banana. 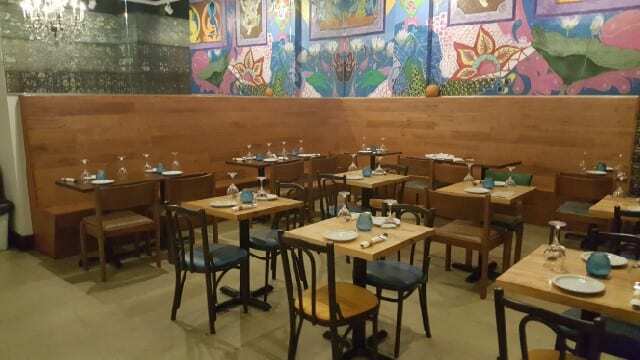 In the back of Chiya Chai is an informal dining room with a colorful mural along the perimeter. 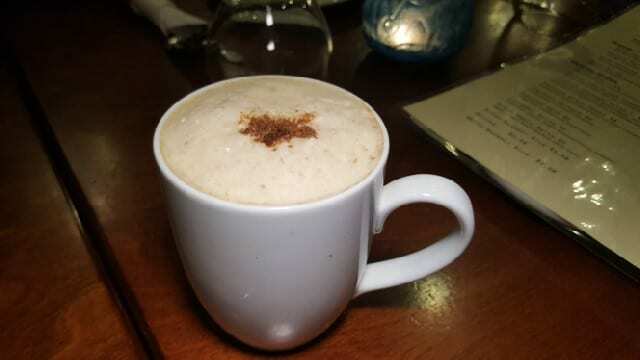 To start the event, we began with a hot cup of Chiya Chai’s housemade chai mix with whole milk. It was warming and rich and the spices were subtle and balanced. After we were warmed by the hot chai, we moved on to chai cocktails. Rajee has crafted a cocktail menu using the spices sourced from Nepal that are also used in the chai blends. 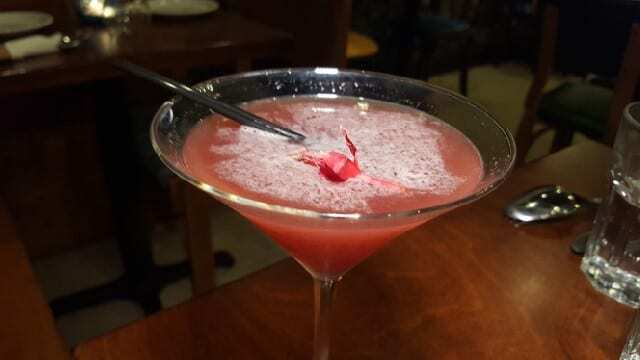 Exotic ingredients and herbs like Chinese Szechuan peppercorns, cardamom and pandanus (exotic tropical plant), can be found infused into the cocktails. Maharaja – Made with gin, cardamom, rosewater, pandanus essence, cinnamon, blueberry juice, fresh lemon juice, tripplesec, this refreshing cocktail is tart with the rosewater dominant on the on nose and the blackberry on palate. 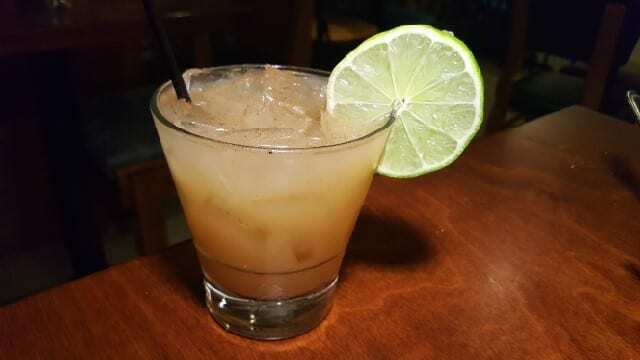 Bourbon Ginger Masala – Made with bourbon, house masala mix, fresh ginger, lime and a splash of soda, the sweetness of the bourbon was in beautiful harmony with the added spices. 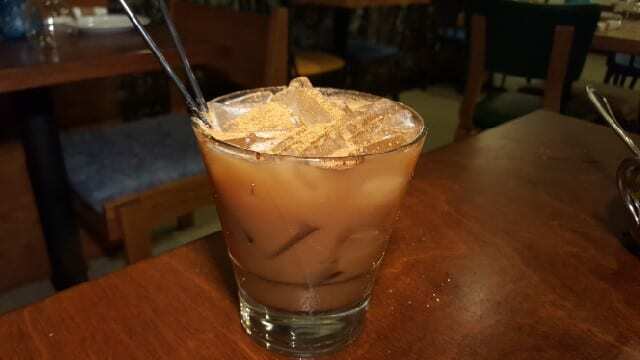 Rum Chai Tea – Made with Kahlua, white rum, almond milk, rice, milk, masala chai mix, vanilla and cinnamon, the drink is subtly sweet and more medium-bodied than expected. While I first thought it would be more of a dessert drink, I found it paired really well with spicier dishes. The menu offers Nepalese and Indian influenced dishes with ingredients made in-house. 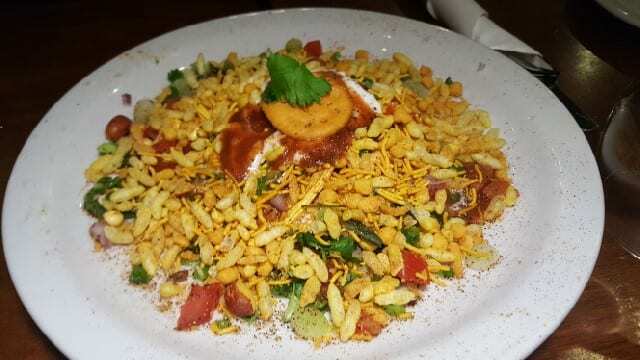 Samosa Chaat – A flattened samosa topped with lime juice, onions, tomatoes, cilantro, chaat spices, yogurt and crunchy bhel. It looked like an Indian version of nachos. There was so much flavor and spice and I found the crunch bhel, a combination of puffed rice and chickpea noodles, to be addicting! 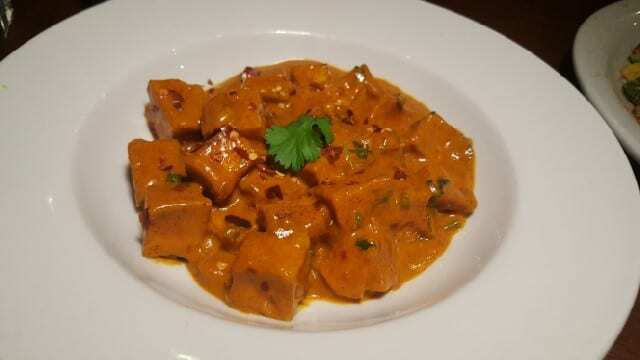 Fiery Tofu – Tofu is marinated overnight in coconut milk with garlic, lime zest and green chilies and then sautéed. It can also be made with shrimp but the tofu had a dense texture and held up to the creamy sauce. Punjabi Spinach Paneer – This curry with spinach and paneer is cooked with creme, roasted cumin seeds, puréed tomatoes and a special blend of spices. 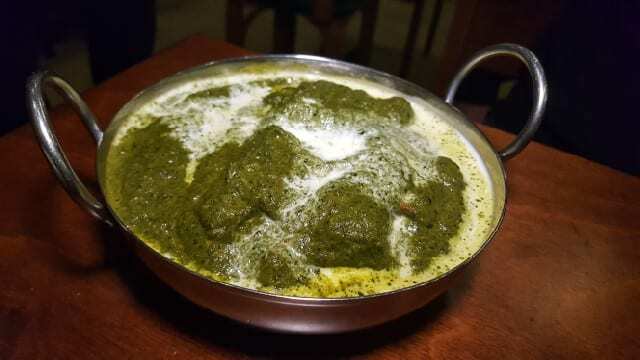 The spinach is pureed and the dish is rich and creamy. 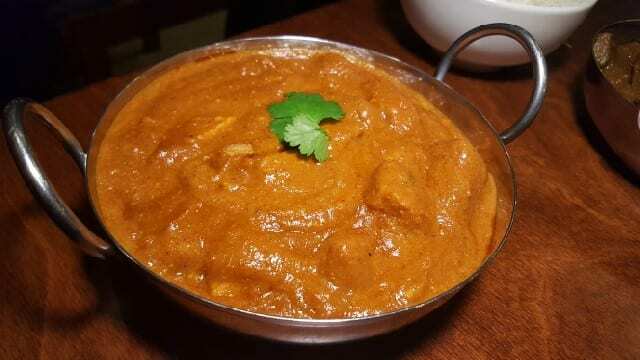 Royal Masala Chicken – Tender pieces of chicken are coated in a rich creamy curry with aromatic spices and freshly-ground almond with paneer. Eggplant and Scallions – Fresh eggplant sauteed with soy sauce, garlic and spices in a tomato and scallions sauce, our server recommended this dish. And it was a great recommendation! The eggplant was perfectly cooked. There was no bitterness and it was tender but not mushy. 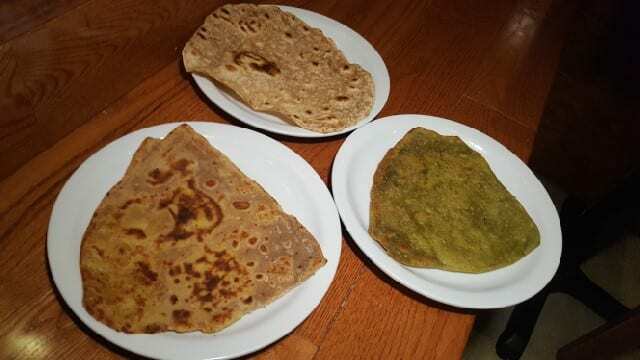 To enjoy with the curries, we had a selection of house-made breads: Aloo Paratha (flat layered bread filled with spiced potato mixture), Kale Paratha (layered bread made with fresh kale) and Roti (whole wheat bread). 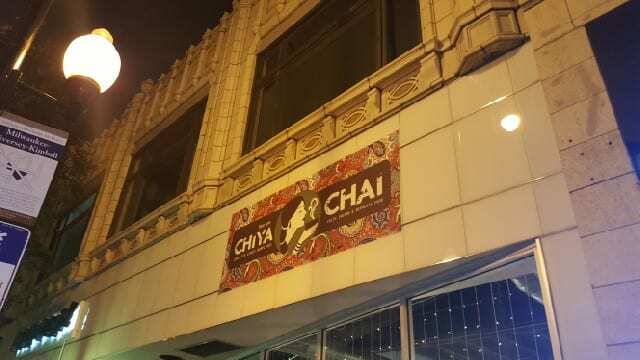 Next time I am in Chicago, whether for lunch or for dinner, Chiya Chai is on my list of stops! This entry was posted in Cocktails, Food and tagged Chai, chai cocktails, Chai Tea, Chicago, Chiya Chai, Cocktails, DrinkWire, food, Liquor.com, Nepalese food, Nepalese tea, Swadesh Shrestha, tea by Allison Levine.